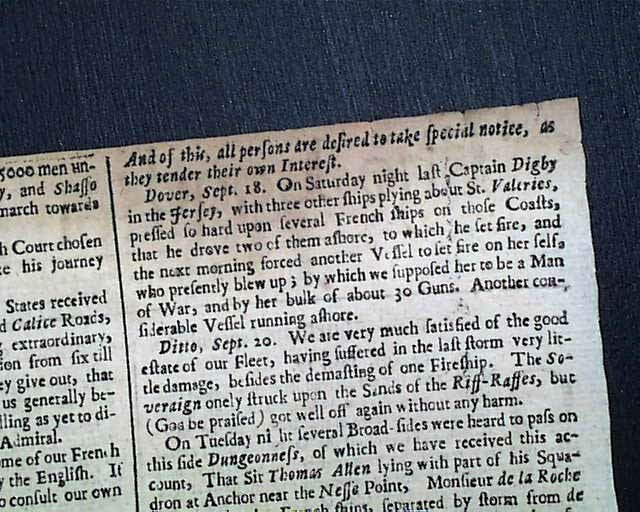 One of the greatest calamities, and more notable events to strike London in its long history is the Great Fire which destroyed much of the city in September, 1666. 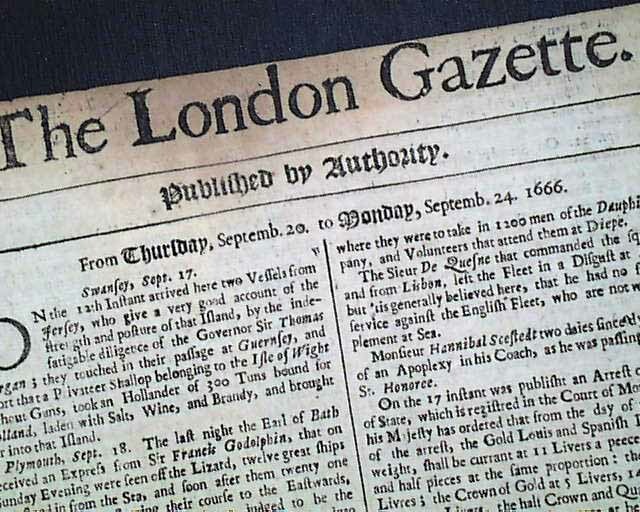 Finding period references to it are exceedingly difficult, as the number of newspapers publishing in 1666 was extremely small, this title certainly being the most significant. 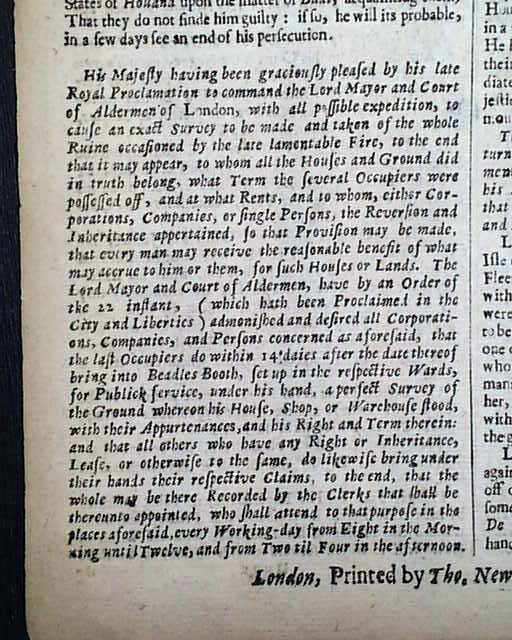 Page 2 contains a report of a Proclamation by the King asking residents to bring in surveys of their property concerning their losses from the Great Fire, for compensation. The text reads in part: "His Majesty having been graciously pleased by his late Royal Proclamation to command the Lord Mayor and Court of Aldermen of London, with all possible expedition, to cause an exact survey to be made and taken of the whole Ruine occasioned by the late lamentable Fire, to the end that it may appear, to whom all the Houses and Ground did in truth belong, what terme the several occupiers were possessed off, and at what rents, and to whom, either corporations, companies, or single persons, the reversion and inheritance appertained, so that provision may be made, that every man may receive the reasonable benefit of what may accrue to him or them for such houses or lands..." with more. The full text of this report is seen in the photos. Additionally, the front page has a plague death report from Norwich, reading: "The account of our Bill of Mortality for this last week runs thus, buried of all diseases155. Whereof of the Plague 140." Note: This, along with the issue of 9/24/1666, are considered (according to a collector who is an expert in insurance history) to be foundational in regards to the development of modern-day insurance. 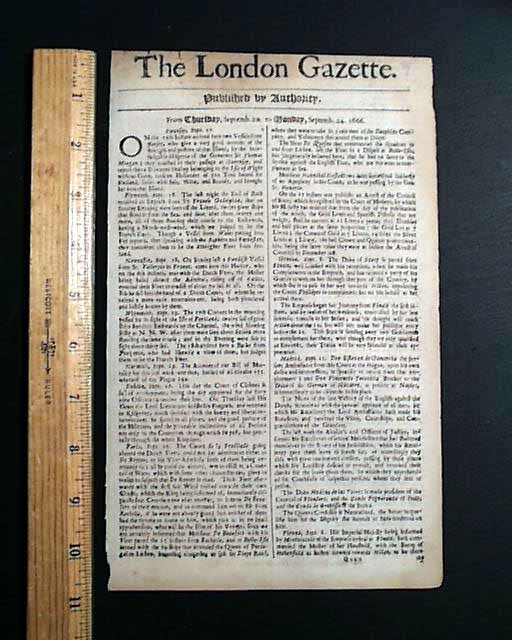 Complete as a single sheet newspaper printed on both sides, and measures 6 5/8 by 10 3/4 inches. It is in very nice condition, with light browning to the top one inch, not affecting any readability (see). 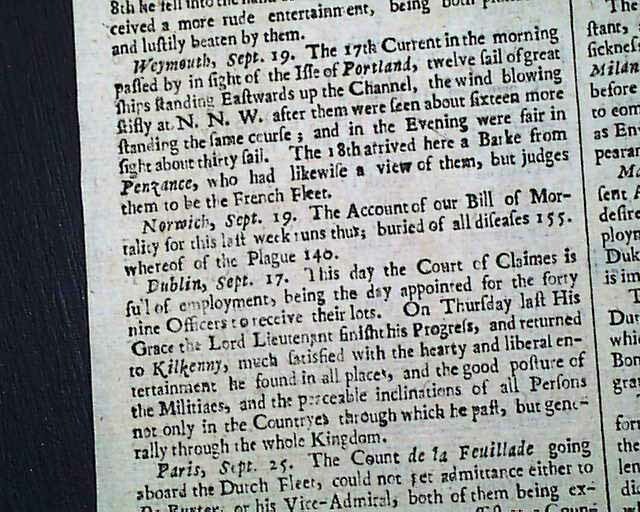 A rarity to find a period newspaper with any reference to the Great Fire of London--and great to have this report in the London Gazette.